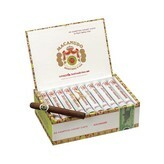 Macanudo is a brand under the operation of General Cigars, and they are also a well-known brand. They’re so well-know, in fact, that they are the best-selling cigar in the world, a cigar that you can find in almost any cigar shop’s humidor, a cigar that you can find for sale online with ease in online cigar shops. If you walk into a humidor and you don’t see a Macanudo cigar for sale, you’re either in a weird humidor or you’re in the humidor of someone with very strong opinions on where cigars should come from. Your standard Macanudo cigar is a light and approachable cigar. However, the Macanudo Hampton Court, often sold in a tube of its very own, is a step above the usual Macanudo, belonging to a line named Macanudo Gold. This is the corona-sized Macanudo Gold cigar, meaning it is five and a half inches long with a ring gauge of 42. It is a light cigar, but one that is big on flavor. The Macanudo Gold, a limited-edition run of cigars, begins with a Connecticut Shade wrapper, lovingly aged and mellowed. Then they are paired with a complimentary tobacco, one that will cooperate well with the flavor profile of the wrapper, and you end up with a light-bodied cigar that offers a smooth, somewhat creamy, and always consistent cigar that you can enjoy again and again. If you’re looking for a great cigar that you will enjoy, or a cigar that you can give to a friend who may not be a cigar aficionado, then this may be just the ticket.